Have you had any fresh strawberries this season? We've found plenty in stores already and berries at nearby farms are usually ready mid-May. With those on my mind, this just had to be the first paper I pulled out of the new October Afternoon Fly a Kite paper pad. Then it was off to find some coordinating cardstock. 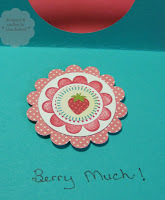 So I take my new designer papers and go through my Stampin' Up! and Papertrey Ink cardstock decks to figure out the best matches. Sometimes I pull out full sheets of cardstock. Then I note the colors that match a particular pack of DSP on the back of the paper pad or on a note I tape to the packaging. That's it. When I'm making a card, I know what is going to work and can pull all the paper out at once. 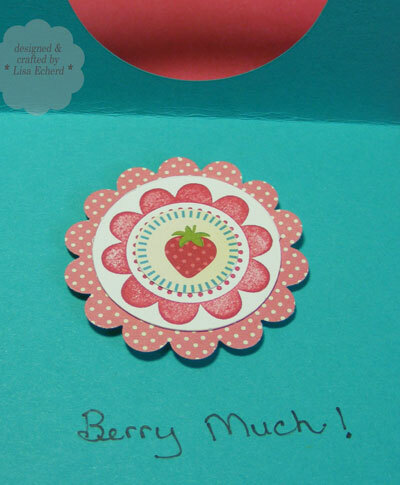 The paper deck I referred to is one I posted here -- Cardstock Reference Deck; Of course, now that Stampin' Up! is changing color families I'll need to redo this deck. As soon as we know the new 2010/11 In Colors, I plan to repost the deck file on Splitcoaststampers with a link here at the blog. It will include all the current and just discontinued colors for SU and Papertrey Ink as well. Yesterday morning, I was making a wedding card for my stepdaughter using some Basic Grey Marrakesh paper with green in it. I didn't even have to check, my notes said Mellow Moss and sure enough it was the perfect paper. Dark Chocolate isn't bad either. Another benefit to doing some matching up is you can see what papers you need. This is going to be especially helpful as I decide what discontinued colors I want to stock up on from Stampin' Up! in the next couple of months. Happy Tuesday! Thanks for visiting! 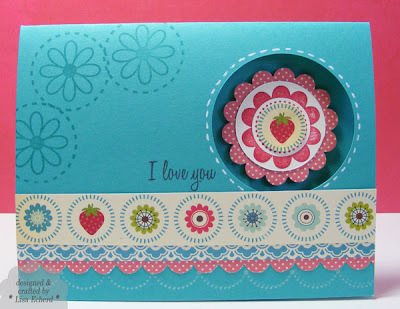 Cardstock: Bermuda Bay by SU!